Jim Caldwell has received strong endorsements from his former boss, Tony Dungy, and Peyton Manning, one of the greatest quarterbacks in NFL history. With the Detroit Lions losing out on Ken Whisenhunt, they didn’t waste much time locking up their next choice. 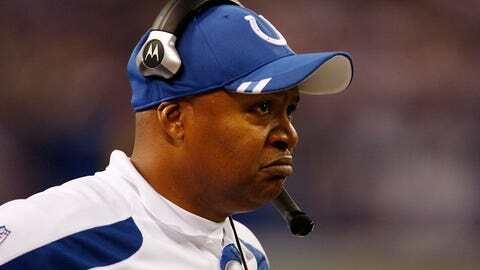 Baltimore Ravens offensive coordinator Jim Caldwell was named early Tuesday afternoon as the Lions’ new coach. Caldwell received strong endorsements from his former boss, Tony Dungy, and Peyton Manning, one of the greatest quarterbacks in NFL history. But is he the answer for the Lions? — Caldwell has been part of three championship teams. He was the quarterbacks coach at Penn State under Joe Paterno when the Nittany Lions won the national title in 1986. He also has two Super Bowl rings, from the 2006 season when he was the Indianapolis Colts’ quarterbacks coach and from last season when he was the Baltimore Ravens’ offensive coordinator and quarterbacks coach. — He’s worked with talented QBs such as Manning and Joe Flacco, which could help the development of Matthew Stafford. Many analysts believe Stafford, who became terribly turnover-prone late in the season, needs to improve his mechanics to be more consistent. The Ravens turned their season around a year ago after offensive coordinator Cam Cameron was fired in December and replaced by Caldwell. — Caldwell has head-coaching experience in the NFL and in college. He led the Colts to the Super Bowl in his first year after taking over when Dungy retired. He also was the first black head coach in Atlanta Coast Conference history when he took over Wake Forest. — Caldwell got fired by the Colts after they imploded during his third year in 2011, winning only two games while Manning was out for the season with a neck injury. Caldwell was widely criticized for his poor game management, including a failure to manage the clock properly in some big games. — In eight years at Wake Forest (1993-2000), Caldwell had only one winning season and finished with a 26-63 record. He appeared to be making progress in rebuilding the program when the Demon Deacons went 7-5 and won a bowl game in 1999, but then regressed to 2-9 in 2000, his final year at the school. — The Ravens are coming off a miserable season offensively under Caldwell. They ranked 29th in total offense (307.4 yards per game) and 25th in scoring with a 20-point average. There have been rumors in Baltimore that he could be replaced as the coordinator. Caldwell, 58, was the first of four known coaches to interview with Detroit. He visited the club’s headquarters in Allen Park on January 3, four days after Jim Schwartz was fired. To prepare for the interview, Caldwell broke down tape of Stafford from last season and then met with the franchise quarterback who is under contract through 2017. "This is an unusual situation because of the fact that you don’t typically walk into a place that has a talented quarterback, one of the best receivers in all the game and just a fine nucleus," Caldwell said in a quote posted on the Lions’ website. "Then a defense that has an extremely talented front four." Caldwell saw that up close when the Ravens helped ruin the Lions’ season with an 18-16 victory in Week 15 on a Monday night at Ford Field. Baltimore’s only scoring came on six field goals by Justin Tucker, including a 61-yarder in the final minute. Caldwell, born in Beloit, Wisc., was a defensive back and four-year starter in college at Iowa from 1973-76. He started out as a defensive coach in college but eventually made the transition to offense. His career took a turn when Dungy hired him in 2001 to be the quarterbacks coach for the Tampa Bay Buccaneers. Caldwell latched onto Dungy, following him to Indianapolis and spending a total of eight years as his assistant before being promoted to replace him. They have similar even-keel demeanors. Dungy is on record saying that Caldwell is the ideal fit for the Lions, who need someone to provide a steady influence and create a winning environment with a culture of discipline. Many thought Whisenhunt, who spent the last year as offensive coordinator for the San Diego Chargers, was the natural choice. He had many of the qualities the Lions were looking for, including experience working with quarterbacks such as Ben Roethlisberger, Kurt Warner and Philip Rivers, along with six years as a NFL head coach for the Arizona Cardinals, and one Super Bowl appearance. But with the Lions ready to send a private jet to go pick him up, Whisenhunt decided to take the Tennessee Titans’ job instead. In the NFL, it’s always ‘next man up,’ and for the Lions, Caldwell is that man.